SOLD OUT...Stylish soft canvas tote bag perfect for fall and winter in a classic deep khaki. Attractive diagonal stitching with accent brads and leather tab front closure complete the stylish tote bag. Use it at the office, dress it down with jeans and a sweater for a shopping day or fill it with the weekends last-minute getaway necessities. 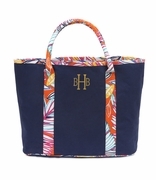 The tote is spacious, features a zipper along the top and two easy-to-hold handles. Interior features one zip and two open pockets. Makes a great gift for the friend or family member starting a new job position, a Christmas present, or treat yourself and carry this great bag heading into fall. Embellish with our new 1" accent monogram initials. NOTE... DUE TO THE FRONT TAB INITIALS WILL BE PLACED ON THE BACK SIDE OF THE TOTE BAG. EMBROIDERY THREAD WILL MATCH FRONT TAB. The canvas tote bag measures 19.5"H x 17.5"W x 6" across the bottom. Soft matching poly cotton lining.